Ideal for all types of skins, it is perfect for make-up removals and corrects any makeup smudges SMAKE-UP it is easy to use: just add a touch of water and remove the make-up as usual! SMAKE-UP is available in Aloe and Argan versions Rich in natural active ingredients, besides removing the make-up, you could also take care of your skin. A truly and natural beauty treatment! SMAKE-UP, the first dry make-up removal wipes in pure cotton with a heart of cleanser that simply activates with water. THE CLEANSER FULL OF ACTIVE PRINCIPLES, TAKES CARE ABOUT YOUR SKIN! Perfect for removing make-up and correcting any make-up smudges, it is suitable for any types of skins. SMAKE-UP It is very easy to use: just add few drops of water and remove your make-up as per usual. SMAKE-UP is available with the cleanser in Aloe and Argan versions. 100% natural and hypoallergenic, clinically and ophthalmologic tested, nickel tested, contains zero preservatives, alcohols or parabens and complies with the European Cosmetotessile Directive PD CEN / TR 15917: 2009 and European Cosmetic Regulation 1223/1009. Thanks to the SMAKE-UP wipes you can take care, clean and hydrate your skin without using other products with a great savings! The wipe is dry and activates with water only at the time of usage: for this reason, once opened the product doesn’t lose scents and keeps properties unaltered until it is used. It is a make-up removals always ready to use! Are you always in a hurry?? SMAKE-UP is super easy to use! Avoid unnecessary wastage of time as you will have only one gesture to remove all make-up and take care of your skin. It is very versatile as you can use at home, at work, at the gym and on holidays. It’s perfect for your travels as light and dry. No limits of 100ml! With the SMAKE-UP wipes you removes the make-up, washes and hydrates your skin and with only one product you have everything you need: practical, convenient and 100% natural! SMAKE-UP takes care of your beauty! EFFICACIOUS … TRY IT NOW! SMAKE-UP is the only dry and natural wipe ideal for make-up removals, for clean and moisturize the skin. Laboratory tests confirms the extraordinary effectiveness. You can bring with you during your business trips, holidays, reducing your luggage weight as you don’t need any cleanser, tonic or creams. Do you have a flight to take? Don’t worry…SMAKE-UP can check in with you as dry and light! Activates whenever needed with just few drops of water, it doesn’t dry out after opening and always ready to use! Choosing SMAKE-UP you will have a tremendous saving on your shopping! SMAKE-UP costs you 75% less then wet wipes and 66% less than cotton pads with the addition of cleanser and or a tonic. All of us always pay attention to the quality of the make-up and cosmetics we put in our basket when we shop to avoid damages to our skin and our health. Very often, we underestimate the importance of choosing an high quality product to remove it and we decide to buy low quality and very aggressive products that causes pores expansions, lose skin brightness and facilitate the formation of pimples, acne or other skin irritations. A particularly aggressive cosmetic will irreparable damages your skin, making it more sensitive and exposed to the risk of irritations. With SMAKE-UP, the time taken to remove make-up is similar as the traditional cleansing method, however you have the advantage of choosing a natural and delicate product that takes care of your skin, making it soft and fragrant and guarantees a fresh clean feeling! TRY IT NOW! natural with very high effectiveness. SMAKE-UP are a dry wipes, hypoallergenic, 100% natural using the finest cotton. With an heart of cleanser that is rich of all the nutrient that you need, it takes care about your skin. As needed activates with water! You can choose between the Aloe (Aloe, Carrot and Vitamin E) and Argan (Argan Oil and Vitamin E) lines. “The best product to adjust the makeup in the middle of the day and always be perfect. Stefania P.Personal Trainer, 28 Y.O. “It’s been a month that I go to sleep without make up. “I went to Madrid over the WE and I left home… the beauty case! With 6 wipes on the bag I travel lightly!! “Finally, a simple way to remove the make-up nice and easily. Alessandra G.Shop Assistant, 24 Y.O. HOW TO USE? IT’S SIMPLE! Use one or more dry wipes. To activate the cleanser already present inside the pads, moisten with a little bit of water whiteout squeeze it! The wipes should be never squeezed after adding water! The product becomes less effective. Apply the wipes on your face and eyes area, let it act for few seconds and then remove the makeup by slightly massage your face with circular movements. After usage rinse or moisturizing creams aren’t required: besides the cleansing action, the SMAKE-UP dry wipes takes care about your skin as rich in active ingredients from the many beneficial properties that leave it hydrated, clean and toned. SMAKE-UP: A TRUELY BEAUTY TREATMENT! 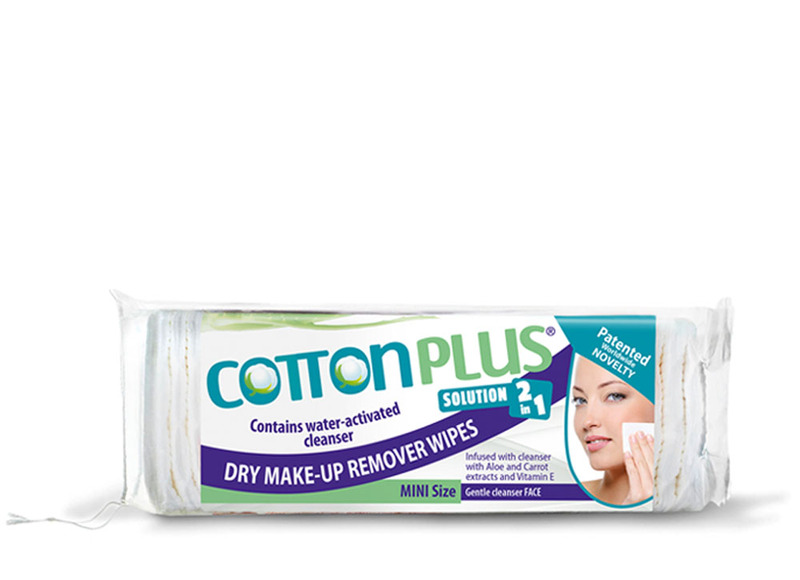 What is the SMAKE-UP Cotton Plus Solution 2in1? It’s a patented, exciting and revolutionary innovation in the world of the make-up removal products! It is a dry wipe, square or rectangular shaped, made with 100% cotton, enriched with a water-soluble cleanser. During usage, it delivers a pleasing fragrance and besides the cleansing actions, it has many beneficial effects for your skin thanks to the active ingredients of natural origins! You don’t need anything else to remove your make-up, just a little bit of water! 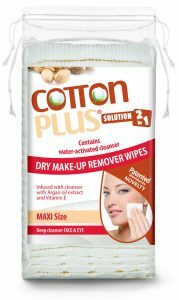 Why should I use the dry wipes SMAKE-UP Cotton Plus Solution 2in1? Because we offer you an alternative almost as comfortable as wet wipes without drying out after opening, containing ingredients that take care of your skin with zero preservatives!!! Is practical, natural, and convenient! Is easy to use in order to remove and fix makeup smudges without spoiling the rest of the make-up. You can also use it only to refresh your face after a long day. You can activate the cleanser wipe as need it, simply adding a little bit of water. You’ll avoid to use any other cleansing products (usually added to the classic cotton pads). In addition you’ll take care of your skin. This will became rapidly your truly beauty treatment! Contains active ingredients with emollients, soothing properties and hydrate your skin! Clinically, ophthalmologic and nickel tested, it is hypoallergenic. Doesn’t contain alcohol, parabens and or preservatives. It saves you money in shopping (it cost 75% less than the wet wipes and 66% less than the classic cotton pads with the addition of cleanser and or tonic). You can also take it with you at the office, the gym, during your trips or wherever you want! How the SMAKE-UP works? How I’ll remove the make-up? To remove your make-up, use one or more SMAKE-UP wipes. Drop a little bit of water on the colored side (use only drinking water) without squeeze it. Now pass the wipe on your face, leave it for few seconds and gently scrub with light circular movements. For the eyes area, proceed gently to prevent the make-up residue to get contacts with your eyes causing unpleasant burns. It is recommended to don’t squeeze the wipe once wet : once squeezed, there is an high risk to drop the effectiveness of the cleanser contained in the pad! So be careful: don’t squeeze it when wet! How do I understand how much water should I add? It is simple! SMAKE-UP should be wet, not dripping! Add few drops of water either directly on the wipes or have in your hands and gently tampon the colored side… it can’t get wrong! Be careful: don’t squeeze the SMAKE-UP dry wipes when water is added as the cleanser contained in the pads would decrease the effectiveness! So be careful no too wet and don’t squeeze it! I’m used to use the classic cotton pads with cleanser or the tonic to remove the make-up: why should I change?? The cleanser or the tonic are great solutions for the makeup removals, but you need several products to get the result: the cotton pad, the cleanser or the tonic, and finally a moisturizer cream. 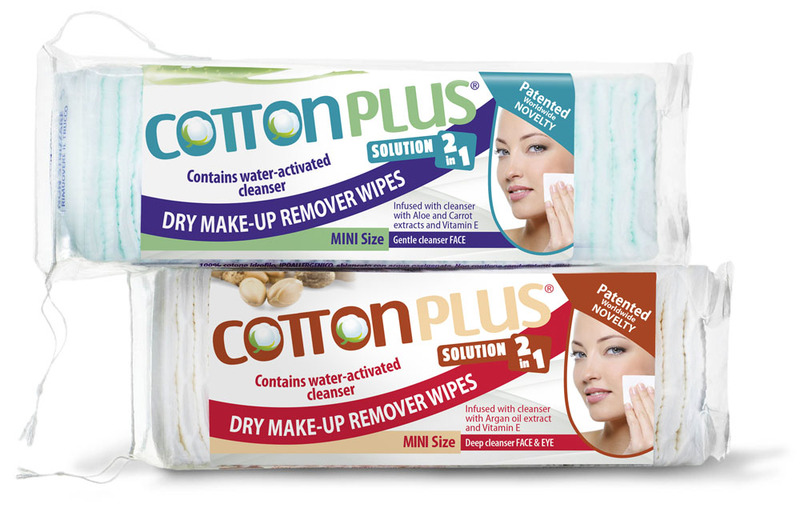 SMAKE-UP of Cotton Plus Solution 2in1 is a one stop shop! In addition, SMAKE-UP doesn’t burn your eyes, irritate the skin, no rinsing required and after usage your skin will be soft and moisturized. You’ll no long feel the need to use any other products. Easy to use, no? I’m used to use the make-up removal wet wipes: why should I change?? The wet wipes up till sometimes ago were the most convenient solution! You can always carry with you on the road, on the job, etc. Although there are different types of wet wipes in the market, many of those are very aggressive to the skin as often contains alcohol, parabens, preservatives, silicones, paraffin … In addition to this, when you open the pack, you must use it in a short period of time or you may have to throw it away as they dry. With SMAKE-UP choose a natural product, formulated to take care of your skin while respecting nature. It doesn’t burn eyes and leaves a delicate feeling of freshness after usage. And once the package is opened, the SMAKE-UP wipes keep all their features untouched until you decide to activate them with water! I’m used to use water and soap to remove make-up: why should I change?? Usually those who choose water and soap are unhappy with the products on the market. You probably have a delicate skin that easily irritates and the cleansing products and wet wipes are too aggressive? Or maybe you don’t use a lot of make up as you don’t think it is worth to spend money for cleanser or tonic? You must to know that a normal soap dries your skin a lot… In fact often the feeling after usage is having the skin “pulled”. The SMAKE-UP wipes are delicate and natural, doesn’t burn any types of skin and doesn’t give you itchiness. You could use for daily facial cleansing or just to remove smog and impurities that have deposited on your skin during the day. Try them! After use SMAKE-UP, I have to rinse my face like a normal cleanser?? No you don’t need to rinse after the makeup remove! The SMAKE-UP leave your skin fresh and clean with a delicate fragrance. I removed the make-up with the SMAKE-UP and now I want to use my favorite cleanser or tonic. Could I use other products? Sure! We have studied a completely natural wipes, made with100% cotton enriched with natural ingredients which has no reactions even in combination with other products. However, you don’t need to do so, as the cleanser contained in the SMAKE-UP wipes is already enriched with active ingredients with different properties for the well-being of your skin (see RANGE). Can I use the SMAKE UP with the waterproof make-up? Certainly! However, some waterproof products contains particularly aggressive ingredients to ensure that the makeup is kept in the same conditions at any given point. As the SMAKE-UP is completely natural and doesn’t contain aggressive skin detergent, we recommend you to proceed with a double passage of the wipe. If isn’t enough, we recommend to choose a make-up that respects the health of your skin. Absolutely not! Actually the SMAKE-UP wipes of the Aloe line, has the cleanser enriched with different kinds of active ingredients including Carrots, highly recommended for tanned skins. How I have to store the products? There aren’t any special precautions, just keep the bag in a cool and dry place. Be careful: The color intensity of the wipes may decrease over a period of time, especially if the package it’s exposed to direct sunlight. This happens because SMAKE-UP contains colors which are not treated with UV protectors. However the effectiveness of the wipes remains the same! The SMAKE-UP wipes has lost bit of color. The properties has been damaged? No, the effectiveness of the product remains the same. In order to maintain the naturalness of the product, we have chosen to use only colors that are not treated with UV protectors. For this reason, the color intensity of the wipes can’t remain unchanged over time, especially if it is exposed to direct sunlight. I read the ingredients of SMAKE-UP and among them I noticed that it may contain C.I. 19140 and C.I. 42090; what are those? These abbreviations correspond to cosmetic colors code listed in Appendix IV of the New Cosmetic Products Regulations. SMAKE-UP guarantees the safety of any formulation with dermatological and nickel tests. It is the product tested on animals? Does it contains ingredients of animal origin? Absolutely not! The product isn’t animal tested and doesn’t contains any ingredients of animal origins. Can I bring the SMAKE-UP with me on the flight on the Carry-on Luggage? Of course yes! Being dry, those wipes you could take it with you while traveling, even by plane in the hand luggage! If you want to save space, just bring some wipes and not the whole pack. Absolutely not. The preservatives are added to all cosmetic products containing water (eg. many wet wipes) to inhibit the development of microorganisms. Despite the continuous study of molecules that are less and less harmful to the environment and human being, preservatives remain molecules that can interact with humans by inducing and stimulating the immune system to an allergic reaction in predetermined subjects. The study on the SMAKE-UP wipes of Cotton Plus Solution 2in1 was focused on the security of your skin. Thanks to our innovative technology, for which we have obtained the patent for the industrial invention, water is no longer contained in the product, limiting the bacterial contamination and avoid the usage of preservatives. Nickel is an element wide present in nature, which is usually contained in a varieties of food, in the water and in most of the metals we have contact with. An high exposure to this element may cause in some subjects an allergic reactions. The SMAKE-UP wipes are certified “Nickel tested”, having passed the most stringent analysis. Turati idrofilo S.p.A. is a leader in the cotton wool production for over 50 years. Our brand, Cotton Plus is a guarantee of quality, respect the employees and the environment where we live. 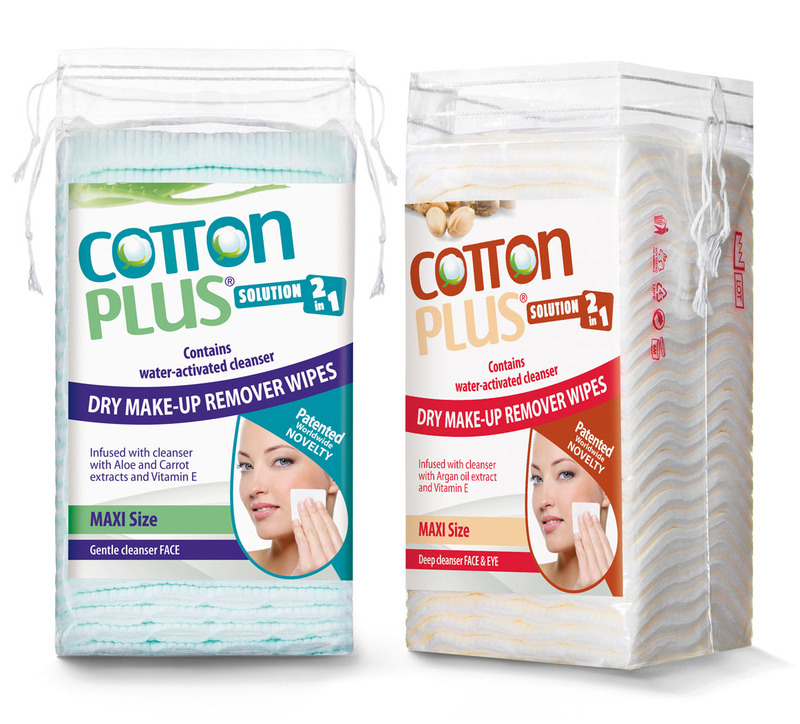 the classic line of cotton buds, cotton pads rounds, ovals and squares shaped. the original Pre-cutted line, perfect for the whole family. the innovative line of Professional Pads line dedicated to professional use in the medical and cosmetic fields. the traditional pleated cotton, cotton roll, cotton silver and cotton balls. 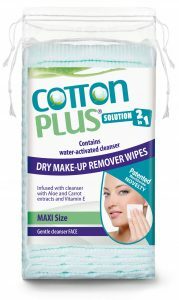 and … the revolutionary SMAKE-UP line of Cotton Plus Solution 2in1: make-up removal products, made with 100% cotton with a heart of cleanser to be water activated.